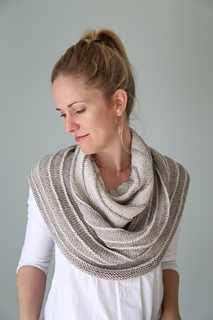 Earthshine is a substantial shawl-cowl hybrid designed for Anzula’s glittering new yarn, Lucero. 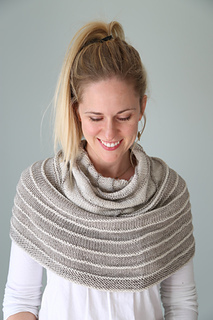 Earthshine begins as a semi-circular shawl, then is joined to work in the round to create a cowl that mimics the look of a big, squishy shawl wrapped around the shoulders. 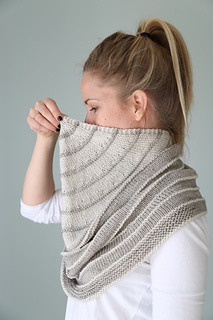 The stripe pattern is simple, with ridges of Garter Stitch against a field of Stockinette that reverses colors halfway through. In subtle neutrals or bold brights, Earthshine is a stunning way to bring a little sparkle to your life! 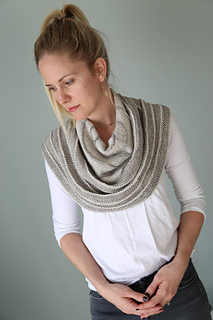 Meeting this exact gauge is not crucial, but any major differences will affect the size of the finished cowl as well as yarn requirements. 10/19/18: All instructions are correct, but in the Body of Cowl section, the round numbers were off by 1 due to an error in the beginning of the section (Rnds 2-10 should have been listed as Rnds 2-9). This was corrected in version 2 of the pattern. Technical editing by Tana Pageler. Please come ask questions and share either in-progress or FO photos in The Yarniad’s Symposium group!